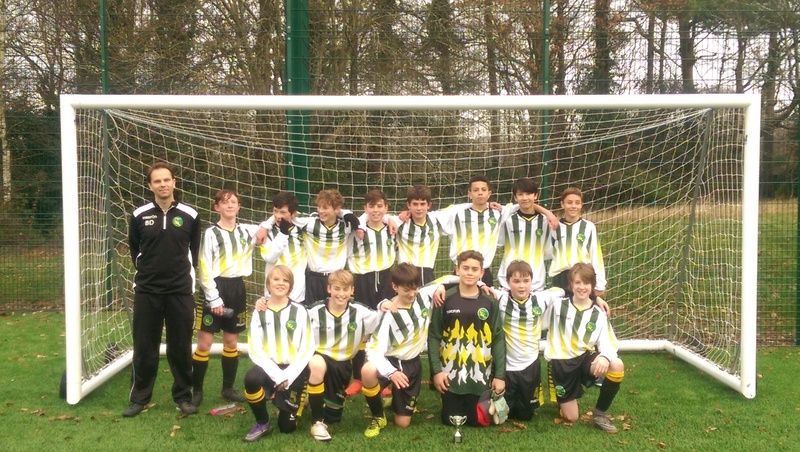 The under 14 Spitfires are managed by Brett Dolman (brettdolman@ymail.com) 07766 550776, assisted by Anthony Forte and will play in the Crowborough League B division this season. The Langton Green Spitfires were formed back in 2011, as a group of enthusiastic U7s. The fact that some of them are still part of the same team speaks volumes for their commitment through cold winters, muddy pitches and our inclusive approach to football, particularly in the early years. We have evolved, gradually but relentlessly, and are a hardworking bunch of committed friends and teammates. Our coaching is dedicated to improving everyone's individual skills, from defence through to attack, across the whole squad, but with an emphasis on team play and team loyalty. Our philosophy is all about positivity and support for each other: we win as a team and lose as a team. Every team starts with a strong defence, and at the beginning of the season we only had one defender, and Luke remains the first name on the team sheet as our fearless centre-back. He has been helped mostly by a trio of midfielders in Cass, Sam W and Leo, who are all fantastic ball-winners and passers of the football, and who are all better centre-backs than they would like to believe. Sam W is blessed with astonishing speed, and with the equally rapid Louis, currently our leading scorer, playing up front, we have learnt to break extremely quickly and make the most of the wide open spaces of our 11-a-side pitches. If that hasn't worked, we have the sheer unstoppable determination of Joe, playing as striker or as an attacking midfielder, or even, once, as right back. Outside, Ben, Xander and Harrison have weaved their magic, conjuring through balls and dribbles to unsettle our opponents and release the space for our strikers (and contributing goals themselves). Dan, playing alongside Louis or Joe, has often been the essential pivot for holding the ball up and playing others through, whilst scoring his own fair share of goals. Fred has transformed himself from a striker into a brick-wall of a defensive midfielder, with a great range of passing. Will S continues to prove that he can play practically anywhere, appearing so far this season at right back, left and right midfield, in goal, and his most valuable position, up front, while his corner-taking has become a potent threat. While at full-back our two new defensive recruits, Monty and Sam S, have starred in their debut seasons, learning one of the toughest positions on the football pitch and play with the widest smiles in the team. Finally, this season has also seen the return of Jack, on loan from the Langton Green Revolution, who has added some much needed strength and quality to our back line and midfield, and our new goalkeeper Will A, who has embraced his new position with enthusiasm, bravery and determination, despite a rotten run of injuries, and is fast becoming the rock at the back to build our performances on. Merry Christmas and Happy New Year, and see you all for the second half of the season in January!